Our Affiliate Leaders Conference theme in Baltimore wasIntent to Impact: Addressing Access, Equity, and Advocacy in Your Affiliate. How are your advocacy efforts coming along? Would you like to share your progress with other Affiliates? Email affiliates@nctm.org, and let us know! We will have our first follow-up webinar on Tuesday, November 7, 7:00–8:00 p.m.
Eastern Time. All Affiliates are welcome to attend, you do not need to have attended the Affiliate Leaders Conference in Baltimore. We will discuss how to design an advocacy plan for your Affiliate and how to overcome some obstacles that may occur along the way. Email affiliates@nctm.org to register for the webinar. Did you miss our Membership and Affiliate Relations Committee (MARC) informational webinar? See the Get On Your MARC webinar video recording. Starting a Student Affiliate Webinar? Do you work with preservice math teachers in a university or college? Please consider sponsoring a Student Affiliate. Student Affiliates are formally organized to support preservice math teachers with NCTM's membership and affiliate benefits. Preservice teachers receive a complimentary NCTM student e-membership for being a member of their Student Affiliate. Contact your MARC regional representative for details, or join us on October 10, 2017, at 7:00 Eastern Time for an informational webinar on how to start and maintain a student affiliate. Email affiliates@nctm.org to register for the webinar. 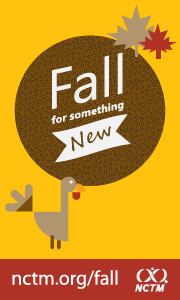 The registration deadline is Friday, October 6. We look forward to seeing you on the webinar. Registration is now open for NCTM's premier fall events: 2017 Regional Conferences and the Innov8 Conference. Innov8 will be held November 15–17, 2017, in Las Vegas, Nevada. 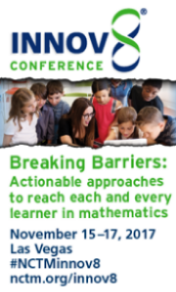 The theme of this year's Innov8 Conference isBreaking Barriers: Actionable Approaches to Reach Each and Every Learner in Mathematics." Go to the NCTM website for a video and details. Click the city to visit the NCTM Regional Conference pages for complete information on programs, housing, and registration. As you launch into the new school year, consider NCTM's free, high-quality tasks to use with your students. Activities with Rigor and Coherence (ARCs) scaffold effective teaching and support you in enacting the eight Mathematics Teaching Practices articulated in Principles to Actions as well as the instructional guidance set forth in 5 Practices for Orchestrating Mathematics Discussions. ARCs are available for major math concepts ranging from grades K–12. Check them out today! 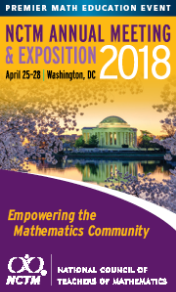 Know an NCTM member who has exhibited a lifetime of achievement in mathematics education at the national level? Consider nominating an exceptional colleague who is a member and who has contributed significantly to math education through leadership, teaching, and service. Supported by MET, the Lifetime Achievement Award will be presented at the NCTM Annual Meeting & Exposition in Washington, DC. 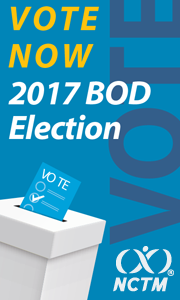 Submit a nomination packet postmarked by November 3. 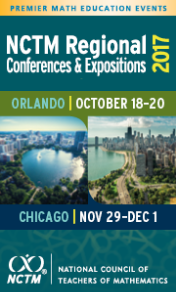 We are just a few years away from NCTM's transition to a fall Annual Meeting & Exposition. Note that April 2020 is the transition year, and NCTM will have a special Centennial Conference in lieu of the Annual Meeting & Exposition. The meeting will resume in October 2020 in St. Louis. Mark your calendar now and plan to attend one or more of these great meetings! Articles Title: A Student Asks about (–5)!